Volvo Buses is taking part in a research project in which used electric bus batteries get a second lease of life as solar energy storage units. An energy warehouse, using electric bus batteries to store solar energy, has been inaugurated in Gothenburg. 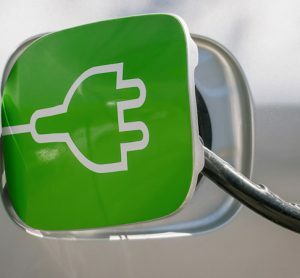 Batteries from electric bus route 55 in Gothenburg, Sweden, are getting a second lease of life for solar energy storage as part of a research project in which Volvo Buses, Göteborg Energi, Riksbyggen and Johanneberg Science Park are working together to examine electricity storage in apartment blocks that have their own electricity production via solar panels. 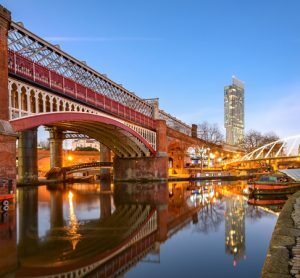 The reuse and recycling of batteries is a key issue as increasing numbers of cities plan to transition to electrically-powered transport. The research is taking place in Riksbyggen’s Viva housing cooperative in Gothenburg, an apartment complex that aims to be Sweden’s most innovative and sustainable housing project – Positive Footprint Housing. 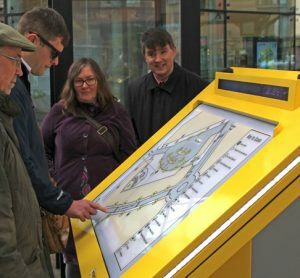 The organisations have created the system whereby energy from solar panels on the roofs of the buildings is stored in batteries that previously powered electric buses on route 55. The energy warehouse is used to cut the property’s power consumption peaks, and to store or sell surplus solar energy. It can also be used to buy and store electricity from the national grid when it is cheap and green, for later use. This improves the efficiency of housing association Viva’s own energy system as well as that of the city’s power grid. “We know that electric bus batteries have good potential for other applications such as energy storage after the end of their life in public transport. What we are examining here is exactly how good that potential is. Use of the batteries in an energy warehouse gives them an extended service life which in turn means better resource utilisation and less environmental impact. 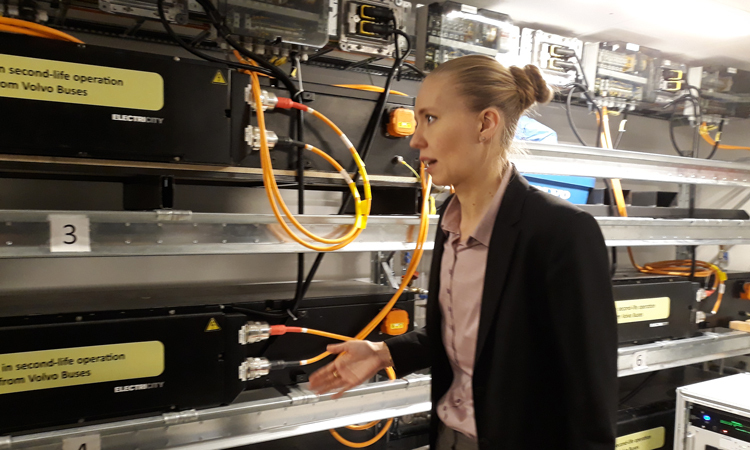 Here at Volvo we are examining various possibilities for the reuse of bus batteries for energy storage, and Viva is one such example,” said Ylva Olofsson, Project Coordinator at Volvo. 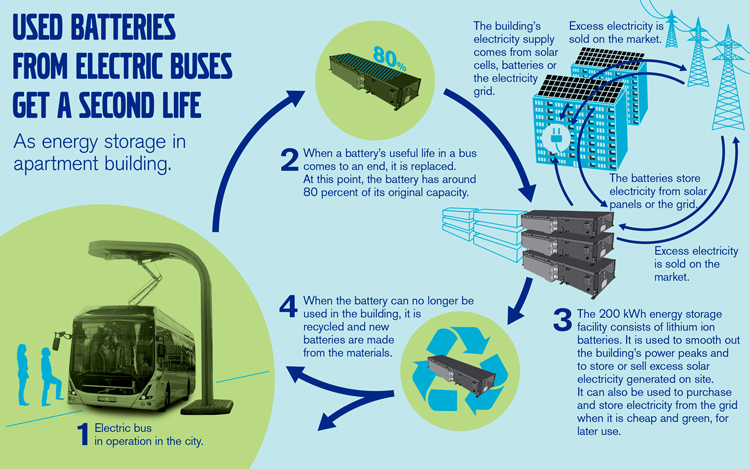 The battery warehouse consists of 14 used lithium-ion electric bus batteries. They are installed in a battery chamber and linked together to create a 200kWh storage pack. This energy warehouse allows a larger proportion of Viva’s solar-generated electricity to be used for the housing association’s power needs. The research on energy storage in used bus batteries is done with support from the EU project IRIS Smart Cities. IRIS is a Light House project, financed by EU HORIZON 2020.